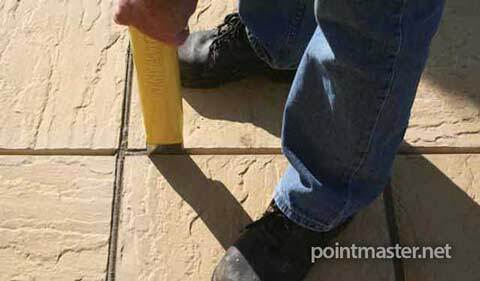 One of the most time consuming and messy pointing jobs has always been the mortar repair of deep joints and stonework. The PointMaster tool takes this in its stride. 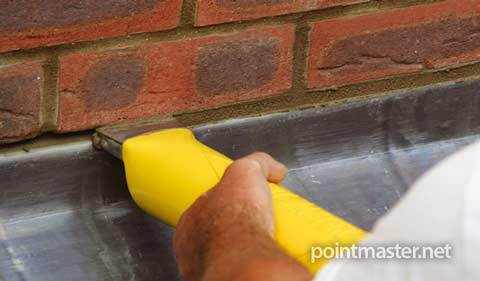 The fast flow rate and positive feedback through the handle as you are using the tool enables the PointMaster to be extremely effective when pointing flint or sandstone walls or any other deep joint mortar application. Heritage deep-joint repair with hydraulic lime mortar. 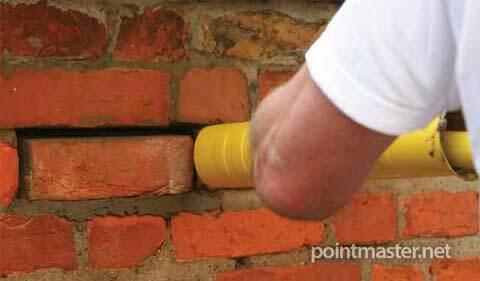 Results are achieved faster and much more accurately than by traditional methods, where the mortar would have to be "thrown" into the joint manually from a trowel..
Because the Point Master is designed to ensure a complete fill of the mortar cavity "from the back", the mortar recess is always completely filled. This ensures the best repair in the shortest time. 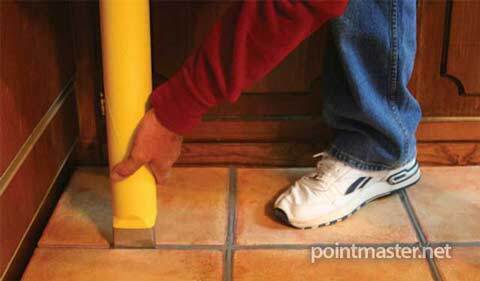 When repairing or re pointing deep joints or stonework, always remember to remove all the loose and powdery mortar back as far as safely possible, then dampen the cavity and existing mortar before you start, to ensure the best adhesion. Click the "Play" button below to watch our flint stonework repair video. 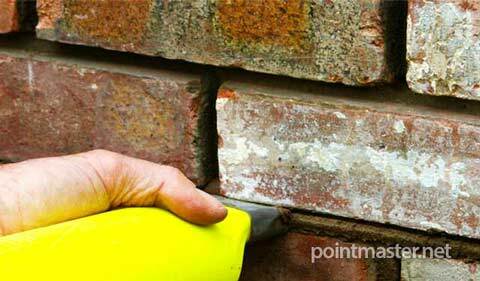 This 2 minute 'start-to-finish' video shows the mix, application and finishing of a reproduction flint wall using the Point Master tool with cement mortar. It clearly indicates how easy the Point Master makes this previously highly difficult job. 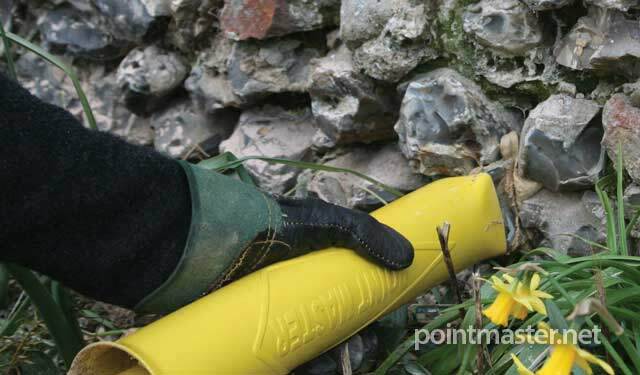 The most common traditional technique, was to throw the cement into the wall from a trowel or hawk. Please note that cement mortar is used because the wall is a modern reproduction. 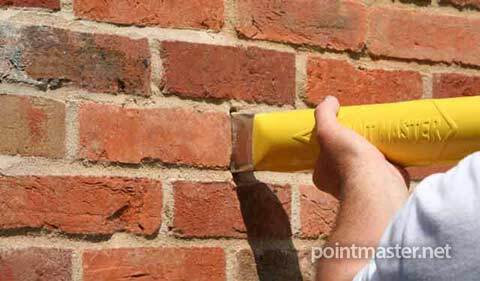 Heritage repairs should always be carried out using traditional materials such as lime mortar, and the Point Master tool.